> with me directly for details. It is with sadness that I learned of the passing of Dennis Ritchie - inventor of C and who made much of Unix, other operating systems, and many software (including Postgres) possible. More details at Remembering Dennis Ritchie: Software Pioneer and Dennis Ritchie, in Memoriam. Dennis Ritchie co-authored the book, The C Programming Language, a classic, which many of my peers grew up with. It was one of the textbooks at MIT for Civil Engineering 1.00 when we were attending when the course was essentially an introduction to programming with C.
The harsh irony is that when Steve Jobs passed away I was probably the only one around me who felt no remorse and hoped the curve fanaticism Jobs fueled would die with him. When Dennis Ritchie passed away I was probably one of the few around me who knew who he was and appreciated the great contributions he made to the computer industry. FOSS 4G 2011 Videos. My resident PostGIS developer strk says he can't see them because blip.tv is using some sort of proprietary video swf format. I can't really tell what he is talking about. Does anyone know if fosslic videos are available in other formats like ogg or a Gnash swf viewer compatible format? We mentioned in prior article Our FOSS4G 2011 the new Stuff and provided the slides in that article. Now we have the video to go with it. Paul's standard State of PostGIS He ran out of time so our's is more like a continuation. We admit to overstuffing our slides with SQL and ran short on time at the end. Leo complained and vowed to do a better job next time. We really weren't expecting such a large crowd. Admittedly I'm all for the after conference experience which is much longer than the conference which is why I tend to make slides that are very dense. WARNING: The following slides feature SQL doing unconventional things suitable only for mature audiences. Viewer discretion is adviced.. You can check out our slides here PostGIS 2.0 the new stuff. We've started work on CREATE EXTENSIONS and have it functional which you can see shown in the pgAdmin snapshots in the slides and the pictures below. In the PostGIS code sprint we attended on Saturday, one of the decisions was to combine what we call core with postgis_raster and make raster compilation not optional. To make this easier, we will be simplifying some of the requirements for compilation of raster like working on making raster2pgsql a regular binary not dependant of Python and also just making the python check a warning. The only python dependency we have in raster is the loader. There are some other kinks that need to be worked out in the extensions mostly to do with uninstall, install from unpackaged, upgrading, move to different schema. There are some errors we are getting which may be issues with the extension model or the way we are executing it. More on that later. Lots of people have been asking about this. It is not currently available in trunk, but Paul has funding to make it happen so its planned for PostGIS 2.0 release. Much later than I would like. We decided to have our code freeze November 30th, first beta December 1st and final release probably early February. I think we had a lot of scope creep, mostly becasue we had no well-defined scope to speak of. I don't think that was a bad thing though. It was more fun to see the features unfold than to have them granularly defined on the outset. Lots of people have been asking the never ending question of when PostGIS is going to get on the band wagon and support KNN GIST like other GIST based types trigrams, full text search etc. Well it's happened in PostGIS 2.0 and now committed. More of the gory details at Indexed Nearest Neighbour Search in PostGIS. In short this will make point / point distance searches and rankings way way faster and help also with other distance searches by providing approximations to start with. We are still preparing the PostgreSQL 9.1 2.0 32-bit windows builds that will have this functionality and should have that ready in the next day or so. To summarize what you can expect. We spent a lot of time discussing and were torn between a box distance operator <#> and a centroid box distance operator <->, so we ended up having both. The reason being is that for some kinds of geometries e.g. streets that aren't diagonal a box distance operator seems to be a much better approximation of distance than a centroid box distance operator. For points of course the two concepts are the same and not an approximation so point / point distance you'd be better off using the new KNN sorting than ST_Distance + ST_DWithin as we have suggested in past. I'll be doing some benchmarks in the coming weeks comparing the old way and speed differences you can expect and perhaps throwing together box and centroid cocktails that combine the two weapons into thought provoking WTFs (or as Dave Fetter would say "That's very Rube Goldberg of you"). I suspect I'll probably be sticking with <#> because I like the symbol better and I was one of the ones fighting for it :). One of the main features I love about PostgreSQL is its array support. This is a feature you won't find in most relational databases, and even databases that support some variant of it, don't allow you to use it as easily. It is one of the features that makes building aggregate functions wicked easy in PostgreSQL with no messy compiling required. Aside from building aggregate functions, it has some other common day uses. In this article, I'll cover two common ways we use them which I will refer to as the ANY and Contains tricks. I like to think of this approach as YeSQL programming style: how SQL can be augmented by more complex data types and index retrieval mechanisms. Arrays and many other data types (spatial types, keyvalue (hstore), ltree etc) are far from relational structures, yet we can query them easily with SQL and can even relate them. Ever have a piece of text like this: apple,cherry apple,avocado or a set of integer ids like this 1,5,6 which perhaps you got from a checkbox picklist? You need to find out the details of the chosen products. If it's a set of integers you would do. Of course for casual lists, arrays are great for data storage as well. We use them with caution when portability to other databases is a concern or referential integrity is a concern. Still they have their place. Which outputs the below. Our dataset is so small that the index doesn't kick in, but if we have a 10000 or more restaurants we'd see the GIN index doing its magic. As a final food for thought, PostgreSQL supports multi-dimensional arrays as well which has some interesting uses as well. Perhaps we'll delve into some examples of multi-dimensional arrays in another article. Here are a couple of key differences and similarities in data types between the two. Some are easy to resolve and others are not. SQL Server, similar to most other relational databases I can think of doesn't really have a true boolean type even in SQL Server 2008 and upcoming version. Leo really loves the PostgreSQL boolean type so much so that he's willing to trade portability for having a real true/false data type. PostgreSQL also has a bit which can be more than 1 in length, but it doesn't cast naturally to a boolean type in applications like SQL Server's bit or PostgreSQL boolean so we suggest you stay away from it for boolean use. Most tools .NET etc. we work with cast both SQL Server bit and PostgreSQL boolean to the boolean type of the application language. When writing raw SQL, however, they are different beasts. are all valid constructs in PostgreSQL but invalid in SQL Server and you could use 0 and 1 too if you install some autocasts in your database as we described in Using MS Access with PostgreSQL which while designed for MS Access work equally well when writing raw SQL. SQL Server 2005/2000 datetime vs. PostgreSQL timestamp with time zone, timestamp without time zone, date, time . This small little annoyance is a less of a concern in SQL Server 2008+ since 2008 introduced (DATE, TIME, DATETIMEOFFSET) which are equivalent to PostgreSQL types so mapping is much cleaner for 2008. If you are converting from SQL Server 2005/2000 you have to consciously think about whether the columns you had the old way should really be timestamps or dates or even times and if you really want the time zone following your data around. For most of the apps we are porting, we don't ever intend to go back nor have it work with anything but PostgreSQL, so we've been taking liberties using syntax that will probably not be portable such as using PostgreSQL array support, complex type, and built-in regular expression support shamelessly just because it makes so many tasks so much succinct and faster. It's a hard decision to make consciously because of the WHAT IFS (not just about betting on success of PostgreSQL, but the fact that you can't market your work to people who need it to work for a different database platform or even a lower version of a database platform). Product lock-in is a reality even when you have no vendors and when you are using open source. Standards are there to minimize product/vendor lock-in, but they often fall short of covering your needs. Product-lockin is a step that should not be taken lightly and should be considered on an application by application basis. It is best to make the decision consciously and play out the pros / cons of what you are gaining and losing. Most of our apps involve lots of stats, complex analytics of which we've decided it's much more efficient to make the database the engine to perform that than to try to write application code so that it works across multiple database platforms. Database lock-in is the lesser of other evils. In SQL Server the standard for casing is Pascal case / camel case as described in our article Of Camels and People: Converting back and forth from Camel Case, Pascal Case to underscore lower case and in PostgreSQL people usually prefer underscores and lower case because upper or mixed case would need constant ugly quoting of columns. SQL Server can get away with this without enduring penalty because while it respects the casing of the columns in design, it is case insensitive when it is used in an SQL statement. So for example if you had a table structure in SQL Server with columns named: PersonID, FirstName, LastName you can reference them as personid, firstname, FIRSTNAME etc.. If you want to keep your code more or less working without changing anything, you are best off just getting rid of the casing of SQL Server columns so you don't need to quote them in PostgreSQL. Same issue holds for Oracle that it is sensitive to casing of tables, except in Oracle case columns need to be uppercase to not require quoting and in PostgreSQL, columns need to be lower case to not require quoting. However if you get really hot an bothered about not having word like breakages in your column names that casing or underscores provide, the thought of always having to quote columns sounds like hell, and this is an application you expect to live with for a while, you may just want to bite the bullet as we often do and change the casing when you migrate. YES, this means you probably have to rewrite a good chunk of your code. We like to think of it as providing an opportunity to refactor our code. I LOVE refactoring. To automate some of the process of converting our table structures from SQL Server to PostgreSQL we opted to write a PostgreSQL function to do it so that we could completely control how it is done. One of the reasons we are porting some of apps is that PostgreSQL string manipulation functions and array support makes so many things easier. One of those things is this. SQL Server by comparison has pretty pathetic built-in string manipulation features. In prior articles we talked about the new PostgreSQL 9.1 extension model and upcoming PostGIS 2.0 extensions which we have experimental builds of so far. In this article and other's to follow, we shall provide a documentary of our venture into this new extensions world. We'll discuss some of the obstacles we had with building extensions, lessons learned, and foolishness exposed, with the hope that others can learn from our experience. First off, the upcoming PostGIS 2.0 extensions will be packaged as at least two extensions -- postgis which will contain both PostGIS geometry/geography types, functions, meta views and tables as well as raster type and associated functions and tables. Topology support, while a part of upcoming PostGIS 2.0, will be packaged as a separate extension called postgis_topology. The main reason for breaking topology out as a separate extension is that it is always stored in a schema called topology and is not relocatable to another schema. The way the current extension model works, all the parts of your extension should live in the same schema. Later we plan to package tiger geocoder as an extension, but this one probably makes more sense to live on http://pgxn.org/ since it is only of interest to United States users, , is purely plpgsql with dependency on PostGIS, and we had beefed it up as part of a consulting contract for a company running PostGIS 1.5. It's the only piece documented in PostGIS 2.0 that works on 1.5 as well (aside from the tiger toplogy loader which has dependency on toplogy), although it has always lived as an extra in the PostGIS code base. We'll probably package postgis_legacy_functions as an extension too for those people who badly need those 500 alias functions I chucked. We mentioned in our prior article that we ran into some issues with how our extension worked -- e.g. topology referencing the postgis extension. Most of these turned out just to be ignorance on my part as to how the different pieces fit together and I'll elaborate on these. Much of what will be described here is also documented in Packaging Related Objects into an Extension. In the future I'm hoping we'll also see plr and pgrouting packaged as extensions which are common favorites of PostGIS users. What is an extension good for? First off, why do you even want to use the extension model? One line statement to install a set of functions in a database that are aware of the fact that they exist as a unit. One line statement to bundle loose functions as a contiguous unit. A declarative way of stating that a set of functions has a dependency with another extension and alerting the user to that during installation. A quick way for user's to know what the hell your module does without trying to guess from the file name. And best yet, so you never have to answer this question again though you may have to answer newer questions: PostGIS backup/restore because extensions don't get backed up aside from the CREATE EXTENSION statement or whatever is marked as user editable data by teh extension packager. Better yet, pgAdmin III has an interface for it so you don't need to remember these commands except the unpackaged one, which sadly pgAdmin seems to be lacking in its arsenal. All these benefits take some effort on the extension packager to make possible. How does PostgreSQL know what versions of a package exist and which is the primary? PostgreSQL looks at this and now knows there exists a version 2.0.0a1 and a file that will migrate a 2.0.0 to 2.0.0a1. This is because I mislabeled the first version of the extension 2.0.0 though 2.0.0 is not released yet. This allows the packager to make possible both downgrade and upgrade paths. the sql files (except for the unpackaged), are the same scripts you would run in prior versions of PostgreSQL, except they are not allowed to contain BEGIN/COMMIT; clauses. So in short making a PostGIS extension that can only install new versions was relatively painless once you learned the nuances of json, control and make install script conventions of the extension model. The control file is a text file that dictates what other extensions are required, what is the default version to install if none is specified, if an extension can be relocated to a different schema and if not, what schema should it be installed in. Below is an example. NOTE: my version has a a1 at the end since its an alpha release. The install from unpackaged is a special CREATE EXTENSION command that doesn't install new functionality, but bundles functions, tables etc. you already have in your database as an extension. You would need this feature for example if you installed PostGIS 2.0.0 not as an extension and want it to become an extension. In this scenario you have 900+ PostGIS functions floating about unaware of the fact that they are part of the same family. This command will christen them as members of The PostGIS family. In the case of PostGIS Topology family, we are talking about 70 someodd functions, types, and meta tables. Still a number too large to count on your fingers and toes. Allowing your extension to be uninstalled requires no extra coding. Yeh I can finally one day get rid of that uninstall postgis script I despise with a passion. It just works and won't allow you to drop if you have dependencies unless you unleash a DROP CASCADE. If your extension is not relocateable such as the case with topology, DO NOT INCLUDE A CREATE SCHEMA in your install script. The extension model creates the schema for you and get's mad when you try to recreate it again in your script. DO NOT PUT ALTER TABLE commands in your install script. It's fine for an upgrade script, but not an install script. strk was being cute and did this in topology so that he could distinguish between the old 1. * topology and the new 2.0. I got a cryptic error with this. Why it had no issue with the ALTER DOMAIN DROP CONSTRAINT ... is a bit of a mystery to me. If you are going to have an extension that is not relocateable and it has dependency on another extension, YOU ABSOLUTELY HAVE TO LIST THESE DEPENDENCIES IN YOUR control file. If you don't your extension will not install. The reason for this is when you mark an extension as non-reloacateable, PostgreSQL sets the schema to the non-relocateable extension schema completely ignoring the database's search_path. If you add dependencies to the control, it will also add to the search_path the schemas of the dependency extensions. Creating an unpackaged script when you have 70 functions to worry about looks daunting on the outset, but there is hope. When you are talking about 70 functions that's scary, and when 900+ with developers adding new ones daily, that is a nightmare unless you have a plan. Sed and I have known each other for a while, but we have been in the past, casual interlopers. I dismissed him as a tool of those underground UNIX folks too in love with their cryptic commands to see the light of day and he dismissed me as a misguided window's user unequipped to appreciate the marvels of stream manipulation. Then one day I had a problem that it seemed Sed might have the best answer to and a 1 line answer at that. I love one line answers which is why I love SQL and spatial SQL. 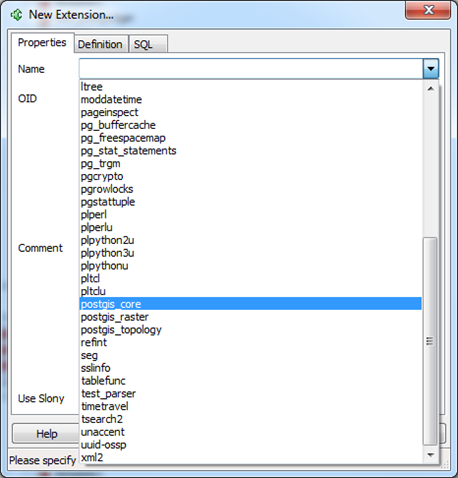 One of the great lessons learned in building PostGIS extensions is my rediscovery of SED. SED turned out to be mighty useful in this regard and I'll explain a bit in this article. Unfortunately there is still a lot I need to learn about it to take full advantage of it and most of my use can be summed up as monkey see, monkey scratch head, monkey do. In addition I came across what I shall refer to as Pain points with using the PostgreSQL Extension model. Part of which has a lot to do with the non-granular management of changes in PostGIS, the day to day major flux of changes happening in PostGIS 2.0 space, and my attempt at trying to creat upgrade freeze points amidst these changes. When PostGIS 2.0 finally arrives, the freeze points will be better defined and not change from day to day. So some of these issues may not be that big of a deal. In the Packaging PostGIS Extensions Part 1, I mentioned a problem I had with converting a topology install script to an Extension unpackaged script. The idea of the extension unpackaged script is to package already installed loose functions, tables, types, operators,etc into a package. This would come about if you installed a contrib module the old fashioned way and then wanted to mark it as an extension so you could experience all the joys the extension model provides. , though needs some slight modifications to work more seamlessly. To get it to work I had to make sure all the function arguments were on a single line in topology.sql. I've been struggling to get it to work with functions where the arguments are broken up in multiple lines. I've learned enough to know it's possible, but just haven't come up with the right sequence of sed to make it happen. This was a minor set back since most functions in PostGIS geometry, geography, raster, and topology have function args defined on a single line in there respective scripts so only about 10 or so need changing. It's just bothersome that you can create a valid install script that can't be converted to an unpackaged script. Any people with suggestions I'm all ears. To summarize what this script does. The first sed -e uses the !d command to delete all lines that don't have a CREATE followed by REPLACE, TRIGGER,TYPE, TABLE, VIEW. This basically just leaves the header lines of each object like: CREATE OR REPLACE FUNCTION topology.ST_GetFaceEdges(toponame varchar, face_id integer) and chucks the bodies. The fourth sed line strips out all the DEFAULT values. In this particular set I have no default args but I do have some in other functions. The fifth line gets rid of BEFORE or AS and anything that comes after and replaces with a semicolon. This I needed because sometimes the AS is put on the first line of the object body and sometimes its now. Basically the intent was to create a micro upgrade script. The first line strips BEGIN and COMMIT clauses since the CREATE and ALTER Extension commands put in their own begin and commit. Since PostGIS doesn't introduce any new complex types in theory for micro upgrades, I could avoid including CASTS, TABLES, SCHEMA, DOMAIN etc. creations. That is what the second line of the sed part does -- strip out all undroppable object types from the update that is all defined on a single line. The third line drops alls such things defined on multiple lines by deleting all phrases that start with CREATE ... up to the ;. It wouldn't work for functions since they could have ; in the body, but for CASTS types etc it works fine. The final sed command looks for AGGREGATE or FUNCTION drops and then adds a line before them to drop the AGGREGATE/FUNCTION from the EXTENSION. This is where my issue starts. In the PostGIS 2.0 wind of changes, people are renaming function argument names every so often, changing AGGREGATES internals, or dropping functions replacing them with equivalents that take default args. Such changed require a DROP of the Aggregate or Function first if it exists. IF EXISTS works great since you don't have to worry about the case of your script throwing an error if it doesn't exist. However, the ALTER EXTENSION syntax does not support the DROP IF EXISTS, so it has to exist. For my older installs, the functions I am trying to drop may not exist. If a object is part of an EXTENSION, it has to be dropped from the extension before you can drop it. This forces me to use a DROP CASCADE clause, which I hate using because it could destroy user defined objects that aren't part of the extension. In those cases I would prefer the update to fail rather than risking destroying user generated data. Keep in mind that in standard release time, these deeper kind of changes wouldn't be allowed so might be a non-issue.